Dedicated, high-performance Fibre broadband from the connectivity experts. Speeds of up to 80 Mbps Up & 20 Mbps Down. 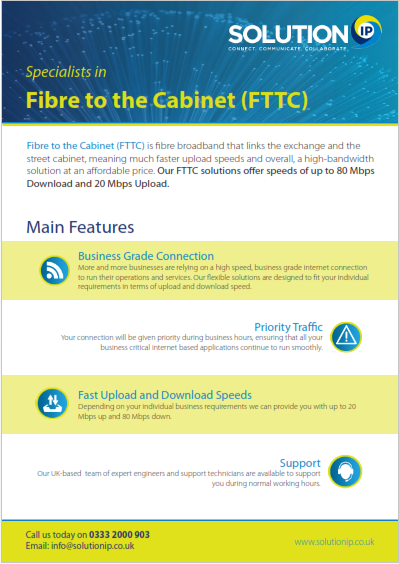 Fibre to the Cabinet (FTTC) is a Fibre connection that links the exchange and the street cabinet. This means much faster upload speeds and a high-bandwidth solution at an affordable price. 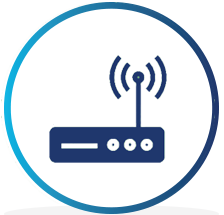 Solution IP are Bristol based experts in connectivity, and can install FTTC solutions quickly and with minimal disruption to your business. We’ve helped companies like yours across the South West to get better, faster, more reliable broadband to improve their day to day working lives. From your perspective, FTTC works in a similar fashion to ADSL broadband, except that it is much, much faster. With download speeds of up to 80Mbps and upload speeds of up to 20 Mbps available, it is also possible for a business to increase speeds if you choose to – our solutions are flexible, meaning you can choose a package that suits your business needs including, if necessary, the option of unlimited allowance. What are the business benefits of FTTC? An FTTC connection is perfect for allowing you to introduce VoIP into your business. VoIP telephony is a great tool for better collaboration, greater flexibility, a mobile workforce and lowered call costs. Faster connection speeds means the ability to use multiple business tools and productivity applications, like video conferencing, messaging and much more. Fibre broadband is ideal for being able to download files and media easily, and upload information too. This is great for sharing information with colleagues or customers. 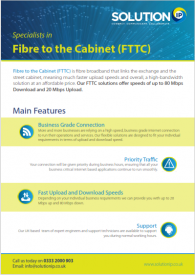 Interested in FTTC? Contact us for a Free Quote!